The nullity of being and the greatness of being. At the core of man is duality. Some might suggest contradiction. Regardless of how it is characterized, man’s essential duality creates tension in his life. For man is both corporal, like every other being that walks the face of the earth, and he is spiritual, imbued with the dignity and divinity of his Creator. At every instance of his life, man teeters and totters, seeking balance between the dual facets of his nature. At each step, he seeks to imbue to natural with the spiritual, lending grace to the most basic of tasks, and to lend humanity to the Divine, bringing holiness within his grasp. No moment is more rife with the tension of man’s duality than his confession on Yom Kippur. The process of repentance and its accompanying recitation of the confession – Viddui – highlights the contradiction of man’s nature. On the one hand, Viddui is a singular manifestation of courage, creativity and spiritual and psychological strength. On the other, it is a powerful statement of self-defeat, a pathetic recognition of human frailty, inferiority and unworthiness. Sincere and authentic repentance depends upon the strength, ability and insight to accuse oneself not only of doing wrong but of possessing a nature that makes such failure inevitable. Viddui is an acknowledgement that one's intentions and deeds are unworthy and tarnished, a shameful cry that, "I have sinned." Repentance is a merciless and boundless expression of self-accusation. However, the irony – and some might suggest, the beauty – of this admission of necessary failure is wholly dependent on man's unique superiority and spiritual greatness. Without such inherent holiness, self-accusation would be impossible. It is only when one is cognizant of freedom, that he can recognize guilt, fragility and temptation and then – and only then – contemplate genuine repentance. The Viddui experience is meaningless without both aspects of man’s duality. His praise and shame are equal parts of the Viddui experience. Regret requires recognition. Yet, recognition is futile unless man simultaneously has faith in his own sacrality; in his creative abilities and talents, which ultimately allow him to repent, to change and to be renewed and reinvigorated. Call it a fundamental irony, a fundamental contradiction or a duality but the praise of man is one and the same as the enabler of his confession. One without the other has no meaning. Rav Soloveitchik Z'L derived these two inseparable elements of the repentance experience from the Viddui recitation of the Jew who apportions his Ma'ssrot (tithes) during the fourth and seventh years of the Shmitta cycle. Such a Jew boasts that he has not violated not even one iota of the commandments; he has fulfilled the Mitzvah of Ma'ssrot to the letter. “According to all your Commandments which You have commanded me: I have not transgressed any of Your commandments, neither have I forgotten. I have harkened to the voice of the Lord my God, I have done according to all that You have commanded me." Such statement in praise of a man extolling his virtues as a God-fearing and obedient servant is categorized by the Sages as a "confession?!" How is it possible to ascribe "confession," a word which conjures up images of weakness and helplessness, to a man elevated to the point of not having "transgressed any of Your commandments?" the Rav Z'L asked. But, that is precisely the point. Only a person proud enough to announce that he has done "all that You have commanded," is also to be expected to humbly submit and admit that he has "not done according to all that You have commanded. The one who possesses the insight and strength to do right is also expected to acknowledge that which is not right. The ability to recognize success is a prerequisite to admission of failure. Both emanate from the same source; both lead to mutually exclusive conclusions – the nullity of being and the greatness of being. The nullity of being leads to the Yom Kippur confession. The greatness of being leads to the Ma'ssrot confession. Both are rooted in humans, created from earth's dust in the image of God. Both forms of confession can at times be integrated. The greatness of being can indeed overshadow the nullity of being. When the Klausenberg Rebbe Z'L addressed survivors from Hungary, Rumania, and Czechoslovakia in the Feldafin DP Camp on Kol Nidre night in 1945, the greatness of being overpowered the nullity of being, despite the dire circumstances and the historical context, which might have led a “rational” thinker to focus on the nullity of existence. Lieutenant Birnbaum reported that he "had never heard so powerful a speech and never will again. When he finished, more than two hours later, I was both emotionally drained and inspired for the best davening of my life." What did this great Rebbe who himself had lost his wife and eleven children to the Nazis say to those who could still see and smell the stench of the crematoria? How could he speak of confessions to those who had witnessed such depraved? How could he speak of such things in the presence of millions of fathers, mothers, brothers, sisters, husbands, wives and children? And so, the Klausenberger concluded with the Ashamnu prayer and turned his attention to the more detailed list of sins, known as Al Chait. Once again, he concluded with the pride of one whose greatness of being supersedes the nullity of being; that the recitation of sins enumerated in Al Chait hardly applied to the worshippers in Feldafig Block 5A. And so the Rebbe Z'L eliminated the Al Chaits one by one, emphasizing how all of these transgressions did not apply to his congregation. In conclusion, he brought the cover of the prayer book, the Machzor. to a close. Seeing the Rebbe close the Machzor, Lieutenant Birnbaum was certain the Rebbe was finished. 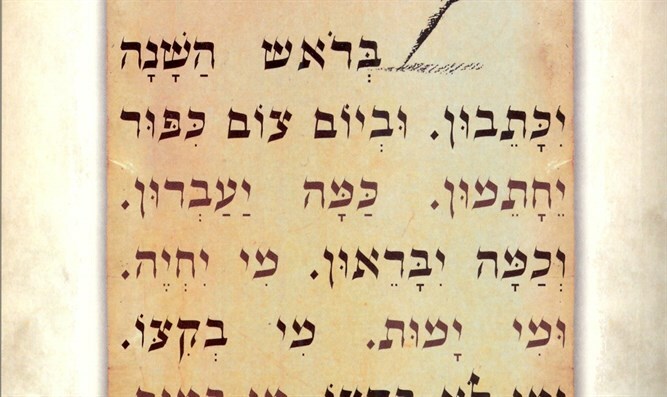 But then the Rebbe asked once again his original question, “Who wrote this Machzor? I don't see anywhere the sins that apply to us, the sins of losing emunah and bitachon (faith and trust in G-d)! “None of us expected to survive. Every morning, we saw this one didn't move and that one didn't move, and as we carried the dead out we looked upon them with envy. Is that emunah in Hashem? Is that bitachon in Hashem? “So, yes, we have sinned. We have sinned and now we must klop al Chait. We must pray to get back the emunah and bitachon that lay dormant these years in the camps. Now that we are free, Ribbono shel Olam, we beg You to forgive us. Forgive everyone here. Forgive every Jew in the world." Genuine repentance demands that the sinner view himself from the seemingly two antithetical viewpoints, the two fundamental truths of his being – from the nullity of being and the greatness of being. The Klausenberger Rebbe Z'L clearly saw both. May He grant us the strength, courage, humility and wisdom to see both as well.